Laos is one of the fastest growing economies in Southeast Asia (SEA). On average the country’s economy as measured by GDP has grown by 7.5 per cent per year and trade by 17 per cent per year since 2000, reflecting the importance of trade as a key driver of its growth. 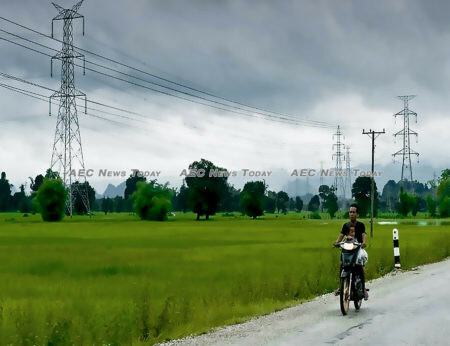 However, while Laos is on its way to graduating from ‘Least Developed Country’ (LDC) status, the nation still needs to overcome ongoing macroeconomic and structural challenges. In March 2018 the United Nations Economic and Social Council (ECOSOC) announced that Laos was eligible to graduate from LDC status. Gross national income (GNI) per capita reached $1,996 in 2017, well above the graduation threshold of $1,230, and its human assets index had reached 72.8 compared to the threshold of 66. Its economic vulnerability index reached 33.7, slightly higher than the threshold of 32 or less. While Laos has passed the thresholds for per capita income and the human assets index, the economic vulnerability index, which measures the country’s resilience to economic shocks and instability, is arguably still to be met. However, only two of the three criteria need to be met to be eligible for graduation. If Laos can fulfil the criteria again in the 2021 review cycle, it will be formally removed from the list of LDCs by 2024. Economic growth going forward is expected to remain robust at 6.7 per cent when the official 2018 numbers are announced, despite flooding-related disasters. Agriculture and industry are expected to expand by 2.5 per cent and 7.7 per cent, respectively. 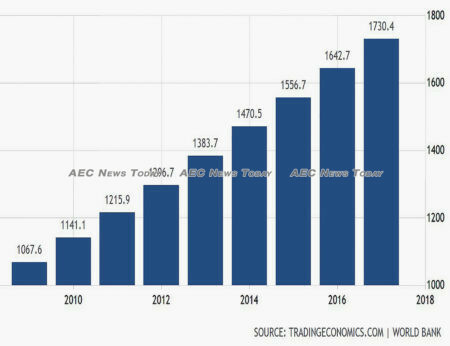 Manufacturing continues to grow, particularly within the Savannakhet, Vientiane, and Champasak special economic zones, while the services sector is set to grow by 7.6 per cent, up from 4.4 per cent in 2017. Declining demand around the world, however, is driving down the prices of commodities such as mineral ores and rubber, which are key income-generating exports for Laos. Still, there is optimism that Laos will succeed in its graduation goal. To that end, the government has set economic growth targets of 7.3 per cent in 2019 and up to 7.5 per cent in 2020. Macroeconomic instability remains a worry though, due to growing public debt, revenue shortfalls, financial sector risks, and limited buffers to shocks. In January 2017 the International Monetary Fund (IMF) raised the country’s risk of external debt distress from moderate to high. 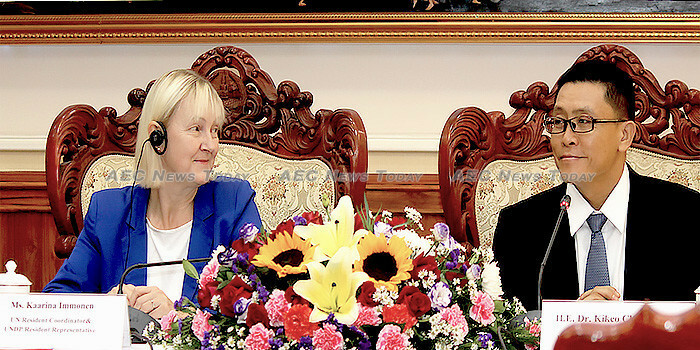 An annual roundtable meeting with development partners in Vientiane in December 2018 called for the Lao government to put greater emphasis on achieving effective fiscal policy administration, while implementing a comprehensive strategy for debt management. To its credit Laos is already taking steps to maintain macroeconomic stability. There will be fiscal consolidation, with the deficit expected to decrease to below 5 per cent of GDP in the 2018 numbers. The government has strengthened public revenue administration and efficiency by introducing electronic tax payments, while adjusting current spending in the first half of 2018. Fiscal consolidation should slow down the accumulation of public debt, but that may not be enough to reverse the rising debt-to-GDP ratio. Another challenge for Laos is a structural one. Laos is still mainly reliant on the production and export of natural resources, with minerals and electricity accounting for 30 per cent of GDP and 60 per cent of total exports. At the same time, the share of traditional exports such as timber, garments, and agricultural produce is steadily declining. Three trading partners (China, Thailand, and Vietnam) absorb 70 per cent of the total export share. Because most of Laos’ export earnings are derived from resource-based products, the country must ensure its export-led growth is sustainable. That may be achieved by diversifying into non-resource activities. Export diversification may help Laos cushion itself from potential negative shocks associated with dependency on natural resource exploitation. It can also contribute to lessening economic vulnerability, which is one of the three criteria for LDC graduation. Going forward,Laos should aim to weather its current macroeconomic challenge and improve the country’s business environment so that the private sector can thrive. An immediate priority is to take bolder steps on fiscal consolidation and fiscal discipline. These should include improving tax administration and modernising fiscal revenue collection to reduce the budget deficit. Public investment needs to be re-prioritised and scaled back, particularly in the hydropower sector given the growing importance of the resource sector in the economy. More importantly, achieving strong and robust economic growth in the long run will need vibrant private sector development. This includes addressing constraints to doing business, investing in human capital, and improving transport infrastructure. This article was written by Buavanh Vilavong, the deputy director general of the Department of Industry and Commerce in Laos. It first appeared on East Asia Forum under a Creative Commons License and is reproduced here with its permission. East Asia Forum is a platform for analysis and research on politics, economics, business, law, security, international relations and society relevant to public policy, centred on the Asia Pacific region. It consists of an online publication and a quarterly magazine, East Asia Forum Quarterly, which aim to provide clear and original analysis from the leading minds in the region and beyond.